Much of baccarat’s popularity is down to its low house edge compared to other real money casino games. But which bets offer the best value for money, and which should punters avoid altogether? We’ll also explain how certain rule variations can affect the odds. House edge is a term used to describe the casino’s mathematical advantage over the player in any given game. When written as a percentage, it represents how much the punter can expect to lose in the long run for every $100 wagered. For example, let’s say we are playing a game with a house edge of 4.50 per cent. According to the probabilities of that particular game, the casino will make about $4.50 for every $100 spent on bets. The expected return, or how much a player can expect to recoup in the long run, is 96.50 per cent (100 – 4.50). Why do online casino games favour the house? Because that’s how the operators make their money. Casinos are businesses, after all, and any gambling business that gives punters an even chance of breaking the bank is destined to go bust. Baccarat is a card game where punters can bet on one of two hands: player or banker. Note that ‘player’ does not refer to the customer and ‘banker’ does not mean the dealer; rather, these are more like the even money bets in roulette (red or black, odd or even, low or high). The player bet pays 1 to 1 odds, while the banker bet usually pays 0.95 to 1 (19 to 20) as the house takes a 5.0 per cent commission on winning wagers. Despite the fact it pays lower returns, the banker bet is better value because the drawing rules in baccarat make it a more likely winner. In a standard eight-deck punto banco game, the house edge is 1.06 per cent for banker and 1.24 per cent for player. Punters can also choose to bet on the tie, which pays 8 to 1 when both the player and the banker hand finish with the same points total. While the higher payout is tempting, a house advantage of over 14 per cent puts the tie wager firmly in the ‘sucker bet’ category. Some baccarat casinos offer 9 to 1 odds on the tie, which reduces the edge to a minimum of 4.8 per cent. Most Australian baccarat games are played with a full shoe of eight 52-card decks, but some versions use six, four, or one. Unlike blackjack, where fewer decks always reduces the house edge when using basic strategy (provided other rules remain unchanged), the number of cards in play affects the odds of each baccarat bet in different ways. 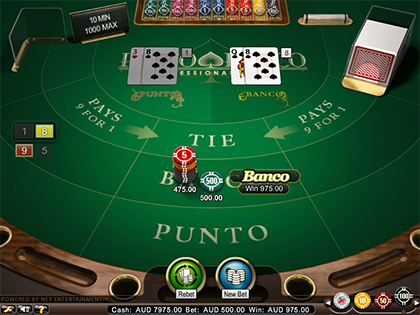 NetEnt Baccarat Pro – The Net Entertainment Professional Series includes both Baccarat Pro (eight decks) and Punto Banco Pro (six decks). Each features adjustable betting limits, so beginners can start as low as $0.10 per hand and the high rollers can wager as much as $10,000. Microgaming Baccarat Gold – Whereas most online punto banco games are based on midi baccarat or mini baccarat, Microgaming’s Gold Series release is inspired by the traditional, full-size tables. The interactive card-squeezing feature is a nice touch, while the single-deck baccarat rules lower the house edge to 1.01 per cent on banker bets. Evolution Gaming Baccarat Squeeze – You will not find a better live dealer baccarat game anywhere on the World Wide Web. The HD video streaming quality is second to none, the studio decor is luxurious and intimate, and the croupiers are of the very highest calibre. High stake baccarat players will also a love bet limits up to $25,000. Betsoft Baccarat – Betsoft’s online table games have a well-earned reputation for authenticity and simplicity, and this one is no exception. Bet between $1 and $100 per hand with standard payouts and a 1.06 per cent house edge. Is punto banco better value than other casino games? In a word, yes. Of all the card games you might find at a gambling site or land-based casino, only blackjack offers better odds than baccarat – and even that’s not a sure thing anymore. That, combined with the fact there is no strategy required, is why high-stakes gamblers love real money baccarat. Get the best odds on real money punto banco at Guts online casino – our number one baccarat site for Aussie players.